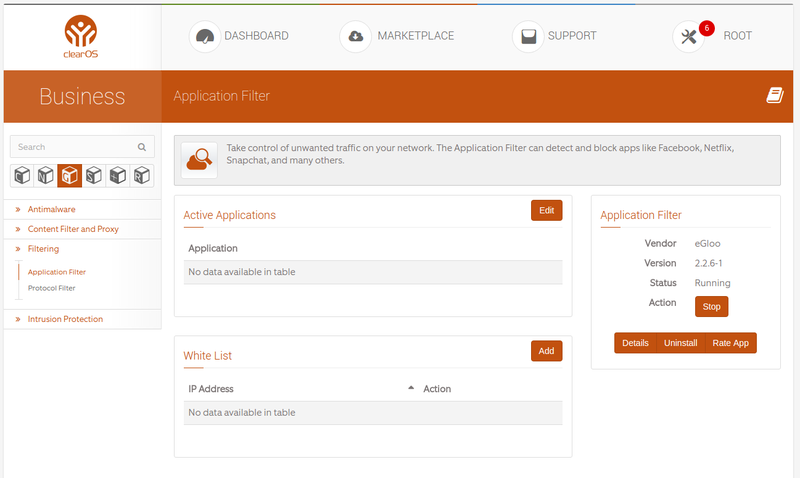 The Application Filter can detect and block apps like Facebook, Netflix, Snapchat, and many others. It performs deep packet (DPI) and SSL certicate analysis to categorize and block dozens of services that be significant productivity drains in the workplace and/or time-wasters at home. The Plex Media Server is a backend application to help you manage and stream media to almost any network connected device. This app has been integrated to ClearOS's Network Map app that allows you to restrict when users/devices on the LAN can access the media server - a useful feature if you allow guests on your network but do not want them to automatically have access to your family photos, music etc. Smart phones, iphones, Windows and Mac desktops have dedicated client applications to stream or display media from your server. Linux desktops can stream the media via an HTML5 browser. Most game consoles like the PS3 are also able to automatically find the service and be used to playback via your television. The Protocol Filter is an application layer packet classifier. It can be used to block unwanted traffic from your network - the most common being to ensure employees, students or end users are using their Internet access for its intended use. The service attempts to identify an application as data packets pass through the gateway and classify them according to known protocols. If successfully identified, user sessions can be blocked based on an administrator's preference and/or policy. With more and more applications like file-sharing and Internet Messaging abusing standard ports designated for legitimate services, the protocol filter app can be a valuable tool in an administrator's desire to control what types of traffic are allowed on the network.